I've always had a keen interest in aromatic plants. And as it so happens, many xeric plants that are native to arid regions of the world, have fragrant leaves and flowers. Which is fortuitous, since I've gardened in the high, cold desert of northern New Mexico for most of my life. Here I have developed a great love and appreciation for Lavender as both an invaluable ornamental and essential nectar source for pollinators. The key to successful cultivation of Lavender is lots of sun, well drained soil and infrequent but deep watering once established. Here's the catch; it's essential that new lavender transplants been watered regularly the first growing season. Their preference for dry conditions begins their second year in the ground as they begin to mature. Plants will reach their full size by the end of the third year in the ground. English and French hybrid lavender like heat and cold, but their enemy is high heat and high humidity. If you're living in a part of the country like Texas, Oklahoma and the Southeastern US where the combination of extreme heat and humidity is common, stick with Spanish Lavender (Lavandula stoechas) as French hybrid and English lavenders will not be long lived. Look around and see what species are growing in your area, but don't be hesitant to experiment. Pruning is desirable to the health and appearance of lavender. I recommend waiting until mid-spring to prune out any winter damaged branches and gently shear off a few inches of the branch tips to shape a round, mounded plant. Deadheading will also encourage more flowers, especially for twice-blooming English types like 'Sharon Roberts', 'Pastor's Pride' and 'Buena Vista'. 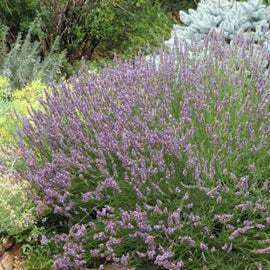 Lavender is not a hungry plant and does best in low nutrient soils. But it's essential to keep their soil healthy. So I recommend fertilizing in the fall with a combination of Yum Yum Mix and Planters II trace mineral fertilizer as both are slow acting nutrient sources for the soil's microbial population and the lavender plants. 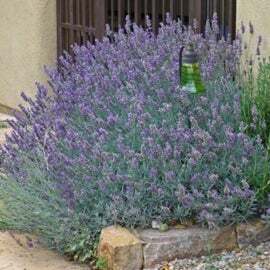 Keep lavender mulched with a 1 to 2 inch layer of small, crushed gravel or pine needles to protect the crown from being splashed with water and mud. A collector at heart, I've been busy over the years amassing a collection of some of the best and most colorful lavender varieties. Here are our most recent additions. 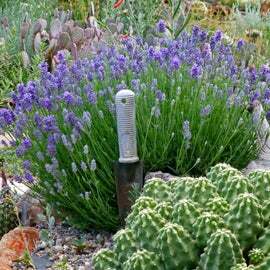 Lavandula 'Wee One' with trowel, to show size. For lovers of small plants and owners of small yards, 'Wee One' is a dwarf grower that appeared in one of my gardens. It's a bee-facilitated cross between 'Thumbelina Leigh' and dwarf white English lavender. But it's smaller than both parents and very xeric once established. Mass it by planting 7 or more plants around ornamental grasses like Festuca 'Boulder Blue' or in front of other large-growing lavender, Salvia, Echinacea, Gaillardia, and Nepeta varieties. A plant I spotted growing in a Santa Fe landscape, this volunteer seedling has the most eye-catching violet-blue flowers I've seen, even darker and more richly colored than 'Hidcote Superior'. 'Munstead Violet' also has very silver mature foliage and is long blooming, from late spring into mid-summer. An exciting dwarf growing cultivar discovered in California, this low growing beauty is covered with dark violet flowers in mid-spring and forms a tidy, low spreading mound of evergreen, gray-green foliage. 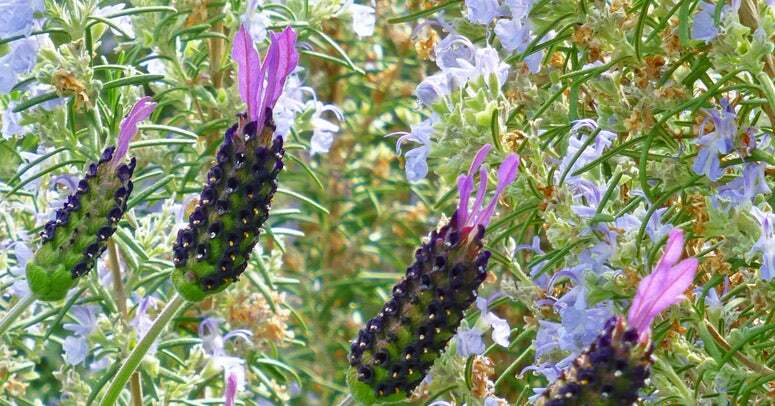 a href="/lavandula-stoechas-lutskos-dwarf">'Lutzko's Dwarf' is wonderful planted around Rosemary or Sage. Selected by Andy and Melisa Van Hevelingen of Van Hevelingen Herb Nursery in Portland, this plant comes to us directly from its native land of Portugal. A batch of wild collected seed was germinated and the biggest and best growing plant, 'Portuguese Giant' was selected and put into propagation via cuttings. A returning favorite, 'Grosso' or Fat Bud (translated from French) is one of the best French hybrid varieties that blooms in mid-summer with a fantastic display of dark blue flower spikes. Large growing, give this beauty at least 3 to 4 feet of width to mature. One of my favorite hybrid cultivars, 'Silver Frost' offers gardeners both great flowers and foliage. Not only does it bloom all summer with extremely aromatic spikes of deep lavender-blue flowers, but it's showy silver, evergreen foliage is just fabulous. It's extremely heat tolerant and is an excellent choice for hot, lower elevation hot climates through-out the intermountain West.